As a Wellington based wedding photographer Paul has a wealth of experience when it comes to answering your questions and helping you plan your day. Below Paul answers a few of the most commonly asked questions, please contact him directly for more information – he’s happy to help! Q. 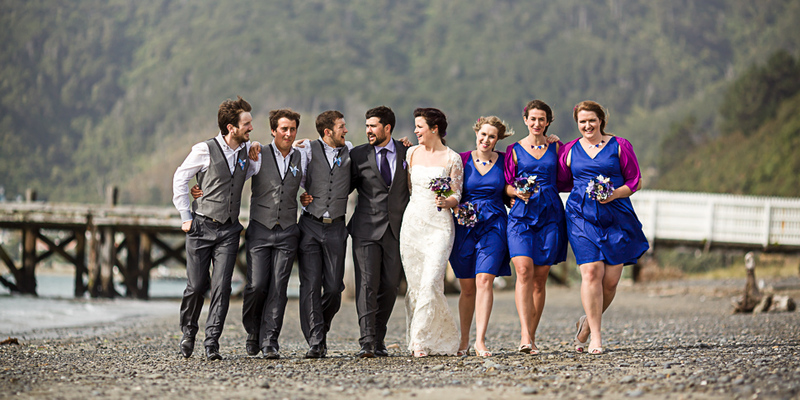 Do you just cover weddings in Wellington, NZ? I am happy to cover weddings both locally and internationally. Currently about half of the weddings I shoot are in Wellington and the other half are Wairarapa and Kapiti Coast weddings. Interestingly a genuine FAQ! I wear a suit, black or grey, with black shoes! Q. How long should we book our wedding photographer for? This really depends on the sort of coverage that you are looking for. All of my packages include unlimited images retouched, treated and cropped onto DVD – the longer that I am there for the greater the variety of shots. Package one includes three hours coverage and will typically include the ceremony followed by some Group/ Bridal Party/ Couple shots. Package two includes six hours coverage and generally allows some build up “getting ready” shots through to the beginning of the reception. A nine hour package will usually include the majority of the day through to first dance depending on your scheduling and extra hours can be added to any package should you need them. I am extremely flexible as to when I start and stop shooting so please contact me with any unique requests. Every wedding day is unique and everything always runs behind schedule! Here’s a typical photographers itinerary for a wedding day with a 3pm ceremony. 1pm – Girls getting ready. 245pm – At ceremony getting buildup shots. 340pm – Ceremony ends – congratulations from your guests. 4pm – Group shots – see next faq. 430pm – Leave for bridal party shots – the time away is up to you, I like as long as possible but you may want to get back to your guests. Allow at least an hour and a half. 630pm – Reception, bride and groom arrive. The order of the next bit can vary greatly. 9pm – First dance and the party starts. 10pm – Photographer leaves if booked for nine hours. Q. How many group shots do most people request? I have shot anywhere from two groups to over thirty during a wedding- just bear in mind that the more group shots you would like the longer this part of the shoot will take. Here is a list of typically requested groups. I also say to all my customers that if they want to grab me at any point during the day (typically at the reception) for an impromptu group shot of certain guests they are more than welcome to. It’s even worth getting the MC to make an announcement to the guests at the beginning of the reception to this effect. Q. How long should we allow for our Couple/ Bridal party shoot? I am happy to spend hours taking these photos as they are some of my favourites, but there is a good chance that you will be keen to get back to your wedding celebration relatively quickly! The main variable here is the number of shoot locations and the distance between these locations – we can discuss this at our pre-booking consultation. However, as a guide people typically leave around 2-2.5 hours between the end of the ceremony and the end of our photo-shoot. This allows for plenty of hugs post ceremony, some family group shots and then 1-2 hours for the bridal shoot- the closer your locations, the quicker this shoot can be. I have also shot Bridal Parties before the ceremony, meaning that the Bride and Groom don’t need to spend any time away from their guests after the ceremony. Every wedding is unique so I am happy to work around your needs. We will always have arranged some backup wet weather locations prior to the big day and I also supply wedding day umbrellas should the bridal party require shelter or shade during their shoot (or just some fun props to play with!). These are extras that can be added to any package. An assistant will make the photographer’s job much more efficient by helping to carry equipment and quickly setup/ control lighting. They also provide a second pair of eyes to spot things like un-tucked shirts, sunglasses left on and flyaway hair! A second photographer will literally double the angles and range of photography and can also be of great help when shooting multiple locations at the same time i.e. Boys and Girls getting ready shots. It is important to book these extras as soon as possible as they are subject to availability. Q. What makes a great location? We are spoilt with great locations for wedding photography throughout Wellington and NZ, especially if you are fans of the great outdoors! Locations that produce great photos by themselves will provide excellent locations for wedding photography! Time of day and weather are also crucial to the locations and I like to have several backups in place should it rain. It’s also great if the location itself means something to you (a favourite walk or picnic spot for example) as this can add greatly to the relevance of the pictures. Where possible we will check out multiple locations prior to your wedding day in person. It’s worth noting that some indoor locations in Wellington require a permit or fee. Q. Does it matter what time of day we have our ceremony? There is no right or wrong time but the best light for photography tends to be towards the end of the day leading up to sunset, typically during most peoples reception! I am happy to plan around you and will be able to get great shots at any time of day. Natural light photography becomes more tricky after sunset. I take a retainer of $500 at time of booking and the balance prior to your wedding day. Q. How much will it cost to hire you- what packages do you offer? Packages start from $1990 and go through to $4990. I always like to meet wedding couples on at least one occasion prior to the big day where possible. It’s a great opportunity to get to know each other and discuss your needs in detail. I am also happy to visit locations with wedding couples and take some test photos in situ – these shots will give you some practice before the big day and give you an idea of what works for you. I love shooting new locations and I am more than happy to travel internationally at cost, please contact me directly for a quote. Yes. You will get high resolution copies of all unique shots taken during your wedding. On your wedding DVD you will receive all shots in an easily printable 6×4 ratio in colour and black and white along with a range of creative colour treatments and cropping. Resolution is from a maximum of 22 megapixel depending on cropping in post-production. Q. How long does it take to produce our wedding photography? The wedding day shoot is just the beginning! I typically allow between four and six weeks to complete a wedding package. Digital post production takes much, much longer than the shoot itself. With every package I post an on-line gallery via my blog. I also post a gallery to Facebook if requested. Wedding albums are included in some packages and can be added to all. As I see myself first and foremost as a photojournalist, I choose to produce ‘coffee table’ style wedding albums, allowing a large number of shots to be included to tell the story of your wedding day. Please contact me if you would like to see any samples. I am based in Karori, Wellington NZ. Q. How long will you hold onto our wedding photos. Whilst I endeavor to archive all wedding photography in multiple locations indefinitely, I take no long term responsibility for it after client delivery. I always recommend that you back your work up to several secure locations. Of course! It’s your day! There is no limit to the number of shots taken, the longer that I am there for the greater the number of shots. I would typically expect to produce from 200 edited images for the basic three hour package. I use high quality professional Canon DSLRs, Speedlight flashguns and in most cases Canon L series prime lenses. Whilst prime lenses don’t offer the same versatility as zooms they do offer by far the best quality images, so I do much of my cropping in post-production. All packages include travel as far at Masterton and the Kapiti Coast, extra mileage is calculated at 77c per km. I have over ten years’ professional retouching experience and apply this knowledge to all of my weddings in post-production. I will edit, colour and crop all of your wedding day images making them exceptional. I will also retouch many of your key shots (things like spots and scratches, tone, etc) where necessary using Photoshop. Have a look in my folio for an idea of the work that I do, Additional hours of specialised retouching can be purchased for $55ph. Q. Who will be our photographer on the day? If you have booked Paul Howell Photography, Paul Howell will ALWAYS be your photographer! Q. Do you have a backup photographer if you are ill? Yes. There are a number of photographers that I can call on should I be unwell but please note that I would have to be so sick that I was physically unable to walk to not shoot your wedding! Q. Why should I choose a professional photographer? Only a professional full time photographer dedicates all of his or her time to producing the best possible photography. Professional photographers are passionate and confident enough about what they do to dedicate their working lives to their art! Professionals invest in the best equipment; the best training and the greatest experience. They also have enough time to do your wedding justice. Wedding photography is, in my opinion, one of the most challenging photographic disciplines out there. It combines fast paced journalistic coverage with portraiture, mixed light scenarios, multiple locations and all on a very tight one chance only time-frame – not something that I would entrust to an amateur. Q. Why choose Paul Howell Photography? I always strive to produce my best possible work on your wedding day. I shoot for my customers first and my portfolio second and aim to make every wedding that I cover the best yet. I am personable and fun on the day, making the photography an enjoyable and memorable part of your wedding. Your wedding day will be one of the most amazing days of your lives and as a photographer I want to record that without getting in the way or having any negative effect on the mood or excitement. One of my customers once said to me that the best wedding photographer is one that you forget is there, but that still exceeds your expectations with the work that they produce. It is true to say that this is my aim at every wedding. If I were choosing a photographer I would first make sure that I loved his or her work. I would then make sure that I felt comfortable spending so much of such a special day with them. I highly recommend meeting any photographer in person prior booking them to discuss your wedding day expectations. I have put this list together using the questions of previous customers – if you have any questions not answered here please contact me directly and I will add them to the list for everyone’s benefit!